Product: Collar Steak • As succulent as prime rib (or even better), the collar steak is the boneless center cut above the shoulder. 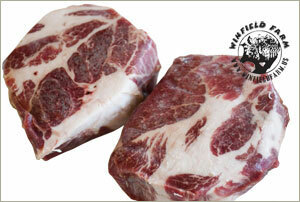 Well-marbled with melt-in-your-mouth magical flavor, collar steaks are great on the grill or slow roasted in the oven. (Chef tip: sear in a super hot pan for just 1-2 minutes per side, then finish on hot grill or in the oven for a few minutes more per side – less than 10 minutes total.). Size: packaged individually ½ lb ea.